Fall is in full force in October, and it is a great month to be active in the garden. 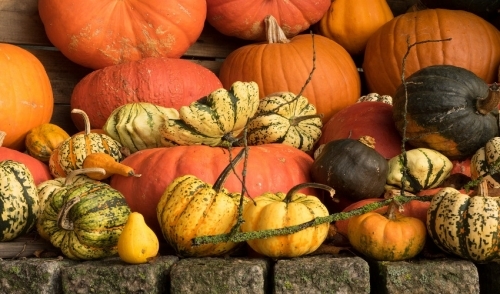 From wrapping up the last harvests to winterizing the garden to awesome autumn fun, there are great ways to keep busy in the garden all month long. Sturdy bulbs can be planted in fall to ensure a bright flowerbed as early as possible in spring. Tulips, daffodils, alliums, irises and crocuses can all be planted in October for a stunning spring display. Delicate bulbs that could be damaged or killed by frost, such as begonias, dahlias and gladiolas, should be dug up and stored appropriately before the first freeze. They can be replanted in spring after freeze danger has passed. As temperatures drop, a thin layer of mulch can help keep plants warmer without stressing them from sudden temperature changes, helping plants harden off their roots for winter. A thicker mulch layer can be applied as soon as overnight freezes begin. So long as the soil is still warm, October isn't too late to plant trees. In fact, planting trees in fall when they are already dormant lessens the transplant shock and allows the trees to focus on root strengthening and growth so they will become established more quickly. As fall rains increase, slug activity will increase as well. If these pests aren't welcome in your garden, now is the time to control them to reduce the overall population so slugs can't take over your garden in the spring. Leaves are falling in October, and it's best to mulch them into small shreds to return their nutrients to the lawn, or use mulched leaves in the garden or compost pile to help enrich soil. Keeping up on this task throughout the month will make it easier. When it is time to put away garden tools, be sure they are cleaned, sharpened and oiled so they are in ready-to-go condition for spring. Store tools and other garden equipment safely and securely so nothing will be damaged over the winter. Weeding is a never-ending task, and it is easier to keep ahead of the weeds rather than let them grow fast and furious in fall. October weeding will ensure there are fewer weeds to compete with tender new plantings or seeds in spring. As October winds down, it is time to finish the fall harvest and freeze, dry or otherwise preserve the bounty before frosts and overnight freezes destroy the produce. And don't forget herbs when closing the garden – they can also be dried or frozen for winter use. The rest of the harvest may be finished, but garlic can be planted in fall to yield a bountiful spring harvest. Be sure the soil is well prepared and the cloves are firm when planting, and there will be a bumper crop to enjoy next year. New plants, including trees and shrubs, should be thoroughly watered until the ground freezes. This will help reduce winter stress and keep the plants healthy through their first winter. The exception is grass, where watering should gradually be reduced in fall. Straw bales are a fast, easy decoration for October gardens, and after they are no longer needed, the straw can be spread around for extra mulch to protect the garden. Bales can also be stacked as a windbreak for delicate plants. Gardening may be slowing down in October, but there is still plenty to keep every gardener busy throughout the month.